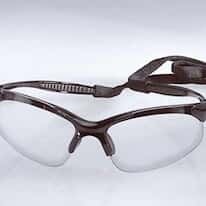 We offer ANSI-compliant safety glasses from industry leaders in safety equipment. OSHA requirements state that protective eyewear and face devices must comply with ANSI Z87.1 (American Standard Protection). ANSI Z87.1 requires that all lenses be permanently imprinted with the manufacturer's monogram and all frames marked "Z87". Our safety glasses also have impact-resistant lenses and strong frames to protect your eyes from flying particles.